Spin the wheel and win a prize! That game was a big draw Friday morning at the Bike to Work Day commuter station staffed by Choose Your Way Bellevue. Cyclists could score a blinking clip-on tail light, a velcro ankle band, or a white flexible headlight, among other swag. But whether they won something useful or not, they all came away with the sense of accomplishment of riding their bikes to work — at least for one day. Bike to Work Day got off to a sunny start in the Puget Sound region on Friday morning, as thousands made their way to work by bicycle. They could stop at dozens of commute stations set up around the Puget Sound. Whether they set a record remains to be seen. 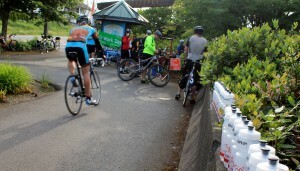 Anne-Marije Rook, communications director for the Cascade Bicycle Club, hoped to beat the record of 16,000 cyclists set on a sunny Bike to Work Day in 2012. 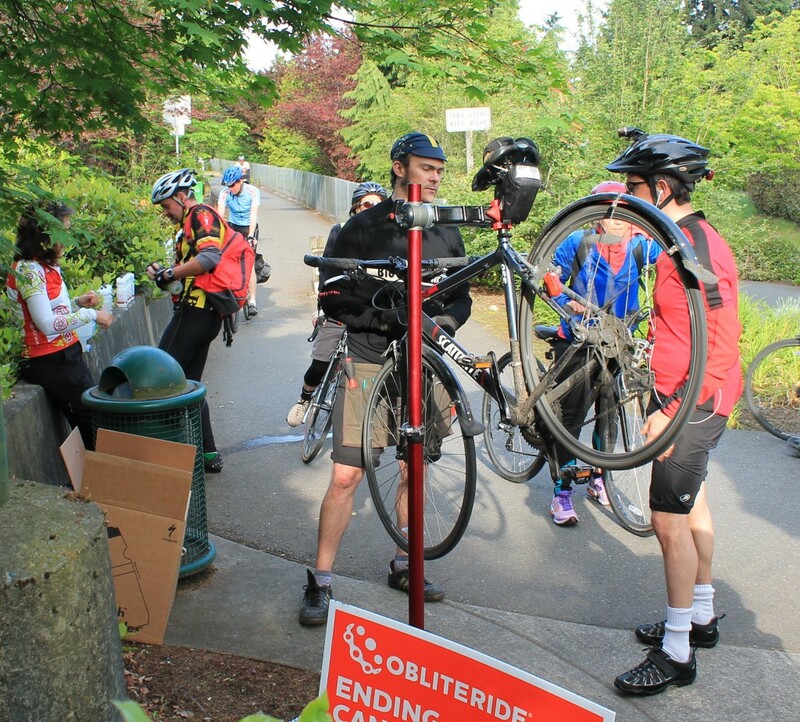 Volunteers at the Enatai bike commute station at the foot of the I-90 bridge in Bellevue were reported that 425 cyclists stopped or passed by by 9 a.m. The record for that location, set in 2012, was 500. 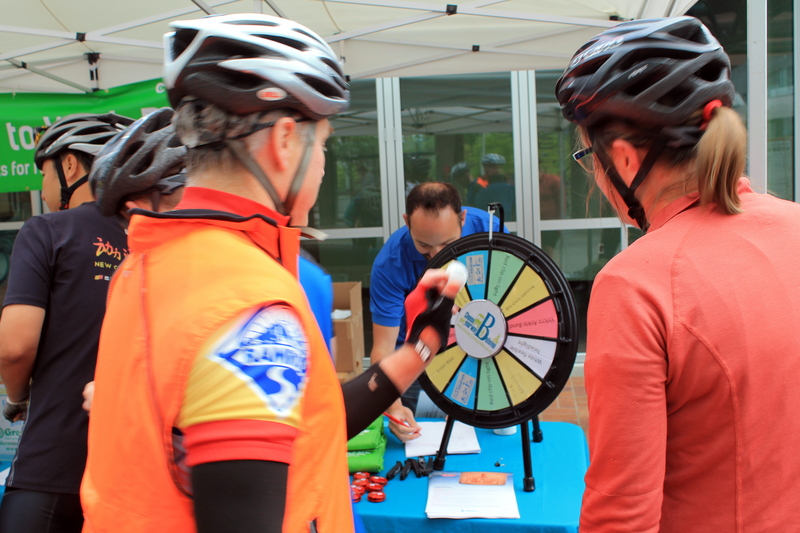 Later on, the volunteers at Choose Your Way commute station at the Bellevue transit center were reporting that 290 had showed up by about 8:45 a.m. Two years ago, only 175 cyclists stopped by that location. Of course this isn’t a contest, but it’s nice to learn that more people are commuting to work by bicycle. 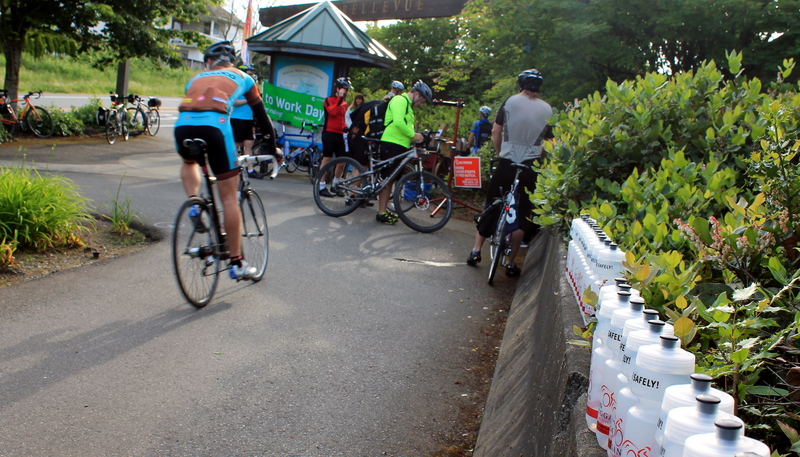 It’s also great to see all the support out there for bicyclists. The bike commute station at Enatai was once again staffed by volunteers for this summer’s Cycle the Wave bike ride, scheduled on Sept. 14. Jason Goodman from Montlake Bicycle Shop also looked over some cyclist’s rides and made some adjustments. You might know Jason from Swift Industries, the Seattle-based pannier builder owned by his partner, Martina Brimmer. Choose Your Way Bellevue helps local companies and commuter find alternative modes of transportation. Staffing the bike commuter station on Bike to Work Day seems a logical fit. Gregg’s-Bellevue bike shop provided tech support to any cyclists who need some help with their bikes. Top Pot Doughnuts supplied the energy. Meanwhile, in San Diego, Bike to Work Day was postponed until May 30 because wildfires have deteriorated the air quality. 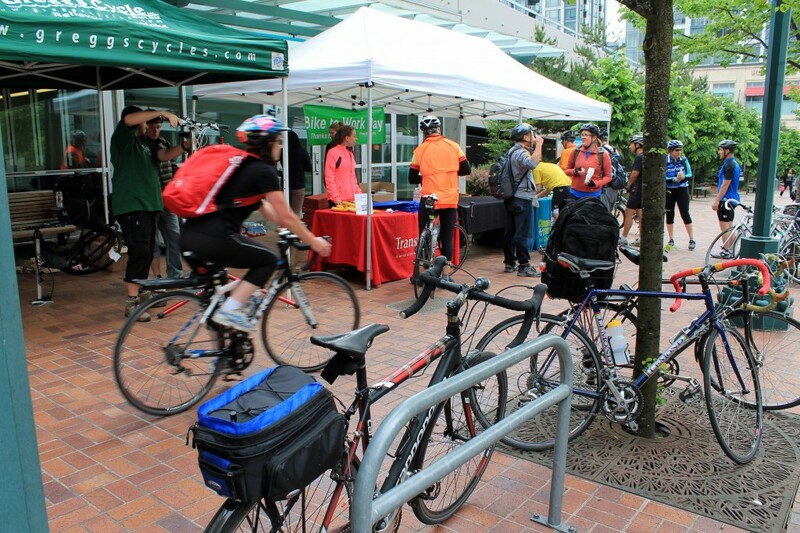 If your commute put you in Seattle today, you might consider stopping by the Seattle After Pary from 4:30 to 6:30 p.m. Friday at the Velo Bike Shop, Sixth Avenue and Blanchard Street in Seattle. Food and beverages provided by Tom Douglas Restaurants. If you want to see the mega-trends for bike commuting, you can check out the American Community Survey Report by the US Census Bureau. 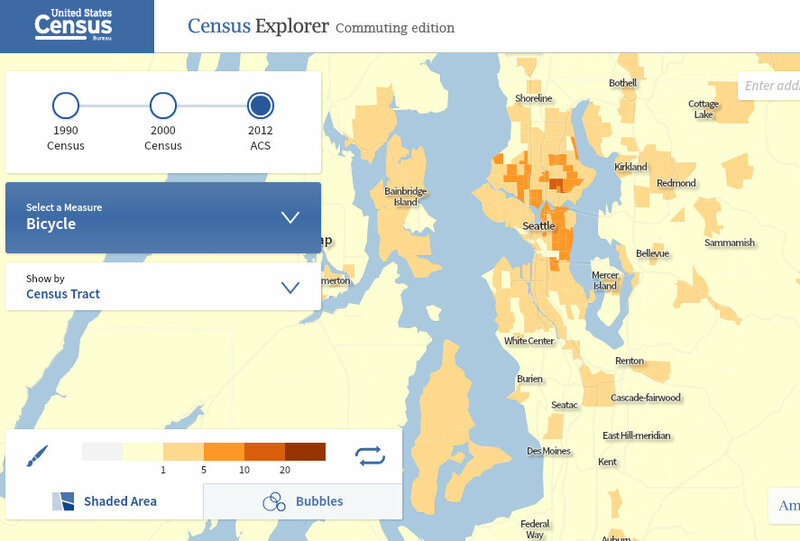 But if you’re more interested to see how many of your neighbors consider themselves bike commuters, check out the Commuting Edition of Census Explorer. 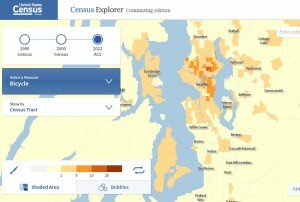 It’s an interactive map that gives results for many measures — including bicycling to work. The results are given by census tract.